Spend less time formatting posts, more time reviewing books, AND keep your review indexes updated—all without falling into a blogging slump. You receive support and updates for 1 year with the option of renewing. This product will ONLY work on self-hosted WordPress websites. It will not work on Blogger or on the free WordPress.com platform. Step #1: Decide which book information you want to display. Ultimate Book Blogger has an easy drag and drop interface where you can enable and disable different pieces of book information. Pick and choose which ones you want to use, and which order you want them to appear in. Plus, you can change all the text associated with each field. Step #2: Create a new post. Create a new blog post like you normally would. But this time, you’ll see a new box for “UBB Book Information”. But guess what—you don’t even have to fill out those fields yourself! Step #3: Enter the book’s title/author or ISBN to fetch data automatically. You can connect Ultimate Book Blogger to Google Books and/or Goodreads and use their data to fetch most of the book information automatically! This will pre-populate fields like the book cover, title, author, series, publisher, number of pages, publication date, and synopsis. Step #4: Write your review. All that’s left for you to do is write your review. Behind the scenes, cool stuff happens automatically. Book information is automatically formatted and added to your blog post. No need to mess with formatting or get that cover to align exactly the way you want. Ultimate Book Blogger takes all that information you filled out, automatically puts it all together in the order you specified, and adds it to the top of your blog post. Your review is automatically added to your archives. This is one of the best parts! Your review archives are automatically populated. You never have to touch these! Each review is automatically added to your “Recent Reviews” widget. Fall in love with reviewing books again. Formatting books and updating your archive can be a draining experience. It’s enough to throw anyone into a blogging slump. Cutting all that out saves you time and can stop you dreading writing you next review. Are you ready to super charge your book blog? A copy of the plugin you can use forever. Lifetime access to the written instructions. Automatic updates inside WordPress for 12 months (with the option of renewing). Support from me for 12 months if you need help setting it up or have any problems (with the option of renewing). Would you like any extra features? 3.4.9 - 4 February 2019 * New: Added "year" column to [index-sortable] shortcode. * Fix: Font Awesome half stars not working. 3.4.8 - 23 December 2018 * New: [book_title] now allowed in the FTC Disclosure label. * New: Upgraded to Font Awesome 5. * Fix: Cache not clearing on blogroll widget. 3.4.7 - 25 November 2018 * Fix: Unable to fetch book info for Book #1 in PHP 7.2 * Fix: "Other books by" sometimes incorrect in some circumstances. 3.4.6 - 24 August 2018 * Tweak: Author, publisher, series, etc. boxes now appear in Gutenberg editor. * Fix: Blank sub-books should no longer appear in review archives. * Fix: Migrate term meta notice appears incorrectly on fresh installs. 3.4.5 - 26 May 2018 * Fix: Missing bottom border on related content box. * Fix: Deprecated function create_function() in widget registration. * Fix: Shortcodes not working in book configuration when using [book-info] shortcode. 3.4.4 - 25 April 2018 * Fix: Don't save empty term meta. * Fix: [nolink] not working with dynamic links. * Tweak: Improve/optimize uninstall process. 3.4.3 - 5 April 2018 * New: Book publication dates from Goodreads/Google are now formatted according to your chosen date settings (Settings > General). * New: Added Goodreads connection status to system info file. * Tweak: Removed old settings class. * Fix: Convert old style "textarea_small" metabox formats to just "textarea" in line with the new metabox code. * Fix: System info file not downloading. * Fix: Undefined index in system info. 3.4.2 - 19 February 2018 * New: You can now use [isbn] in dynamic links. * Fix: Add better backwards compatibility for checking license key status for add-ons. 3.4.1 - 23 January 2018 * Tweak: Remove category restrictions on blog tour meta box. The meta box will now appear on posts regardless of which category the post is in. * Tweak: Improve backwards compatibility with book info on custom post types to ensure styles and scripts get loaded. * Tweak: Remove unneeded CMB2 files. 3.4 - 20 January 2018 * New: Updated interface for adding multiple books to a post. * New: Log plugin installation date. * Tweak: Plugin has been refactored and reorganized. * Tweak: When fetching info from Goodreads, use "work" original publication date if regular date is not provided. * Tweak: Adjust description for beta opt-in. 3.3.8 - 7 January 2018 * Fix: Social media widget not saving when adding/editing follower numbers. New: Add opt-in to beta versions. Fix: [rating] placeholder not working on review by title index. Fix: $wpdb->prepare() warning notice on reviews by title index. Fix: Use https for Goodreads URL. Fix: Related content feature now uses all of a post's terms when looking for related posts (instead of just the first one). Fix: Audiobook feature in Currently Reading widget didn't always correctly pick up audiobooks. Check now happens via taxonomy instead of post meta. Fix: Related content now responsive. Fix: Sortable review archive table now responsive. Fix: Don't set taxonomy meta keys when fetching book from GR/Google and multiple books feature is disabled. Added new debug mode in Ultimate BB > General Settings. Sortable Archive: Fixed sorting on date column. Fix invalid license key status in system info file. Reviews Widget: Use local time when determining current month's reviews. Reviews Widget: Cache results for six hours. Books Reviewed Counter Widget: Cache number of books read this year for one day. Goodreads Shelf Widget: Increased cache time from two hours to one day. Goodreads Shelf Widget: Fixed caching. Cache now works properly and the cache will flush when saving the widget. Reviews by Rating Widget: Cache for one day. Giveaway Widget: Escape all attributes. Giveaway Widget: Use site's local time when determining if a giveaway has ended. Giveaway Shortcode: Use site's local time when determining if a giveaway has ended. Remove list-style: none from reviews by year archive. Updated Font Awesome to 4.7.0. Added upgrade routine for icon tags. Flush rewrite rules on activation. Reviews by Title: Fixed error on archive if first sub-book has "do not add to archive" checked on. Schema markup is now added if "Add Schema Markup" is enabled, not necessarily if "Schema - Start" is enabled. This allows for better custom manipulation of Schema markup. Removed persistent admin notices for expired license keys. Review archive cache was moved into one big array rather than individual options. Escaped a few attribute values. Removed commented out code from title archive. Ensure that sub-books don't get added to review archives if "don't add to review archives" is checked on (fixed: sortable, taxonomy). Updated language files (and fixed a typo in their file names). Author bios no longer appear in the_excerpt(). Sortable Archive: You can now filter by multiple reviewers by separating their usernames with commas. Updated how license keys are stored so you no longer have to click "Activate" to activate them. Image resize functions now support Jetpack Photon. Fixed issue with "Schema - Start" not adding any content. Added new graceful error message if you don't have PHP 5.3+. Added actions and filters to the Currently Reading widget. Added filters to UBB_Book_Fetch class. Fixed a problem with Google Books not fetching the book cover. But covers are smaller now due to a change in their API. Added new "System Status" page to Ultimate BB settings. Force cURL requests to shop.nosegraze.com to use TLSv2. Removed old, unused image slider code. Fixed a problem with dynamic links sending along the site URL, thus breaking the results. Added some Akismet antispam methods to the front-end upload class -- for future use. Modified sanitization on front-end upload class to account for arrays as well as text fields. Updated all instances of get_terms() to use new format in WordPress 4.5 update. Fixed a bug with the author website URL being used as the blog URL. Added new filter for currently reading query args. [index-for] shortcode no longer includes child terms. Removed empty space in giveaway widget. Adjusted code in giveaway widget to fix some incorrectly nested if statements. Added some DNF icons that are the same as the zero star icons. Refactored UBB_Book class to be a bit more efficient. Added support for upcoming 4.5 changes to the term edit page. Fixed a problem with duplicate books showing up in "posts by same author/series". Review Archive: Adjusted purge so it works on reviews by author archive when filtering by user. Review Archive: Fixed a glitch where excluded posts weren't being excluded. Front-end uploader: Fixed a problem with descriptions not appearing (review requests add-on). About the Author: Added a new setting to Ultimate BB > About the Author where you can add extra social media sites. These will then appear in Posts > Authors and in the about the author box. Fixed a problem with reviews by title archive not purging when using user ID numbers. Updated code to use new Term Meta in WordPress 4.4. This is done for author and narrator bios. New minimum version requirement of WordPress 4.4. Updated documentation URLs to point a new docs site ( docs.ultimatebookblogger.com ). Fixed styling issue in the settings panel with WP 4.4. Added a Help Scout beacon to the settings page. Added new infrastructure for handling database upgrades. Wrap-Up Shortcode: Added support for tag filtering in the query. Reviews by title: Fixed a problem where "Don't add to review archive" wasn't being abided by. Books reviewed counter widget: Progress bar now doesn't show up when disabled. Added capabilities field to the settings panel (for use in Review Requests add-on). Fixed a problem with the Sortable Archive not purging correctly when filtering by a specific user (ie [index-sortable reviewer="username"] ). The "Send Cover Data to Facebook" option has been reworked to also send the cover to Twitter (and thus renamed to "Send Cover Data to Social Media"). All review indexes have been reworked to try to optimize them a little and hopefully speed up processing times. Fixed a fatal error with the last related posts fix. Fixed a bug with [index-feature] archives not updating. They are now cached using transients. However, they will still not forcibly update when manually clicking "Purge Cache". Related Posts: Now only the FIRST taxonomy term is shown in the related content tab (ie the FIRST author). This was already the case for the names shown on the tabs, but then the list of posts inside would be by multiple authors (if multiple authors were added to the post). Now only the first author's name is shown in the tab and only the first author's posts. Added support for "About the Narrator" using shortcode [about-narrator name="Narrator Name Here"] Also follows automatic display setting rules. Fixed a problem with [simplerating] not working in the Reviews by Title archive. You will need to purge the cache to get the fix. Changed the way the book cover gets displayed in the code. It now utilizes the "Edit Text" field so you can customise the HTML around the book cover. You can now link the book cover to Goodreads by editing the "Edit Text" template for the book cover and adding a link tag with [goodreads] as the URL placeholder. Fetch from Goodreads: Added an error message if the response code is not 200 (ok). Upcoming Reviews Widget: Featured images are now used if there is no UBB book cover. Note: The book title must also be filled out in order for the featured image to be used. Upcoming Reviews Widget: Fixed a glitch with the widget sometimes displaying an incorrect book cover. Fixed a problem with the Rating Report add-on where "0 Stars" was selected by default. Fixed a problem in the Upcoming Reviews widget where no reviews were shown if you had -1 entered as the number of posts. Fixed a problem with the Reviews by Year review index not displaying/caching properly. Now it's not cached at all. Fix: Fixed a problem that was preventing the author's "Facebook URL" box from showing the value (in Posts > Authors). This did NOT affect the field being saved or displayed inside a post. It just affected the saved value from showing up in the Edit Author box. Styling Issue: Fixed settings panel "Save Changes" and "Reset Tab" buttons from being cut off slightly at the bottom. New Feature: Added two new colour pickers in the "Styling" tab for customizing the content warning box. Tweak: Restructured the get_value() method in the UBB_Book class so that nothing is returned until the end. This allows for easy filtering of every value via add-ons. Addition: Added a new method for getting the number of sub-books in a post. Fix: The Upcoming Reviews widget now supports sub-books. Fix: Neither ISBN nor ASIN were showing up in the book info when filled out. Fix: Recent Reviews widget was showing the incorrect number of books if you had sub-books entered. Fix: Upcoming Reviews widget was showing the incorrect number of books if you had sub-books entered. Addition: Added a filter for the Blog Tour meta box arguments. Reviews by Title archive now once again accepts user logins in the reviewer parameter. This gets converted into the user ID number later in the code. The Goodreads Shelf Widget now displays a link back to the Goodreads shelf to comply with the Goodreads Terms of Service. Fixed a problem with the Books Reviewed Counter Widget displaying an incorrect value. Added support for adding more than one series to one book. Fixed a problem where sub-books had the incorrect rating in review archives and wrap ups. Added more actions and filters to various parts of the plugin. Fixed an infinite loop in the "Features" archive, which caused not all posts to show up. Fixed a problem with sub-books having the wrong number (just repeating "Book 1" for each book). Social Media Widget: Removed YouTube from the list of social media sites that update automatically. You now need to manually enter your number of subscribers. Social Media Widget: YouTube field now asks for your full URL. Reviews Widget: Changed the "while" loop to an if statement to prevent the wrong books from displaying. Added a few more filters and actions for add-ons. The Facebook open graph data is now only displayed on the 'post' post type. Reviews by Title archive: Fixed an infinite while loop that occurred when 3+ books had the same title. Reviews by Title archive: Completely re-coded and reduced page loading time by 93.6%. Turned the review archive cache back on. Fixed an incorrectly referenced sprintf function on the Review Indexes settings page. This caused mismatching shortcodes and descriptions. Fixed a problem with the "other books" feature. It wasn't recognizing old posts where the "Author" field may not be filled out (pre-v3). Added an import/export feature to the settings panel. Fixed a problem with the Dynamic Links feature where the [author] shortcode wasn't being converted on books where the "Author" textbox (new in v3) wasn't filled out. Taxonomy slugs are now translation-ready. Fixed a problem with the "limit other books" feature not limiting results. Reviews by Rating archive: Now displays the correct rating for sub-books. You can now change the "orderby" and "order" parameters for the following indexes: [index-for tax="book-genre"] [index-series] [index-narrator] [index-author] . The order will affect the posts listed under each item. Here's an example: [index-series orderby="date" order="DESC"] Possible "orderby" options are: ID, author, title, date, rand, comment_count. Possible "order" options are: ASC, DESC. Settings Panel: Text fields are now sanitized with wp_kses instead of sanitize_text_field to allow for some HTML. As a result, some HTML is now allowed in the purchase links "Separator" field. The UBB Giveaways meta box will now disappear if your post is not in your chosen Giveaways category. The UBB Blog Tour meta box will now disappear if your post is not in your chosen Blog Tour category. There's a new option in Ultimate BB > Book Information for hiding the UBB Book Information box when a post is not in your chosen Book Reviews category. Fixed a problem with the Illustrator field not using the correct label/text on the front-end. Added Open Graph meta for the book cover (to send to Facebook). Fixed some incorrect translation strings. Reviews Widget: fixed a problem where the same book cover was being shown twice if featured images were selected. 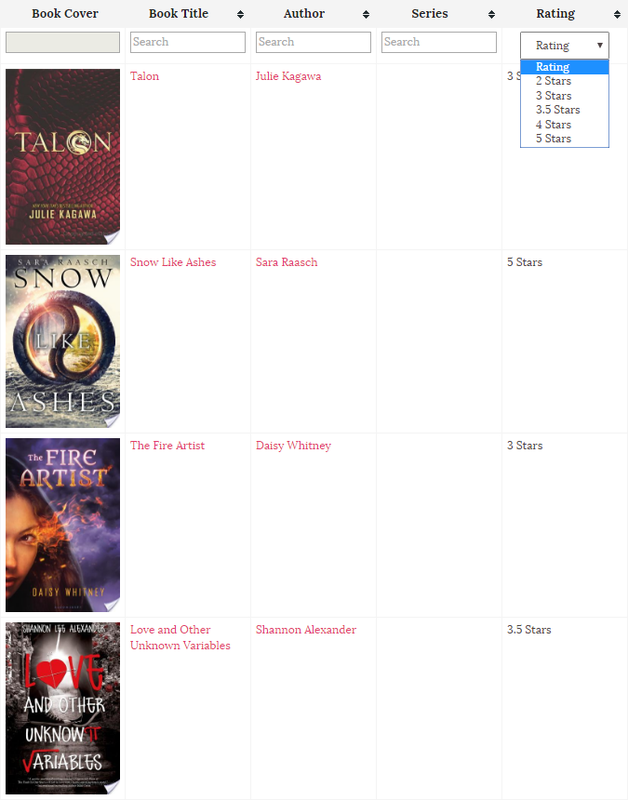 Reviews Widget: if you choose to only show 5 books, then only 5 books are shown, taking sub-books into account. Previously it only considered the number of POSTS rather than the number of BOOKS. UBB_Front_End_Upload class: added a catch for WP_Error object after inserting a term. Books Reviewed Counter Widget: Now supports sub-books and they will be added to the progress bar. Removed Facebook from the list of automatically updating social media sites, as they have removed public access to their API. You now have to enter your number of likes manually. Fixed a problem with 3.0.7 where book info would appear multiple times, only if related posts were enabled. Added extra checks before automatically displaying book info. It will quit out of the filter straight away if we're in the admin panel or if the post isn't a supported post type. Switched to using the date_i18n function in the Reviews Widget. Now the month names should be translated into your language. Fixed a problem with the wrap-up-posts shortcode where there were empty bullet points for non-book review posts. Added new author links for Pinterest, Instagram, and their Amazon page. About the author links are now centered. Added a new settings panel callback for "users", which is a dropdown of all registered users. Added some new styling for form classes. Added new UBB_Front_End_Upload class, which is used in the Review Requests add-on and Review Submissions add-on. Fixed sprintf error with the custom post type labels. Fixed some inconsistencies with the [wrap-up-posts] shortcode. It was displaying duplicates of some entries and different date formats for reviews vs non-reviews. Fixed a problem with automatic updates working incorrectly for add-ons. The [book-series] shortcode now only displays the series name - not the name and number. Fixed a problem with the book cover sizes not working correctly. Fixed incorrectly sized thumbnails in the Related Posts feature. Social media widget now has options for inserting the follower label after the number (ie "Followers", "Subscribers", "Likes", etc.). Fixed "Other books in this series" feature. Should now display other books. Dev: Added a new filter for the book info value ( get_value() method in UBB_Book ) for use in future add-ons. In the review index purge function: modified the get_users query to only apply to authors of the site (posting capabilities). Purge review index cache now only happens when post transitions from unpublished (draft, scheduled) to being published. Added 5 custom book info fields that can be used for anything you want. Modified the "Edit Text" window in the book config. Now when you click "Save" the window automatically closes much more quickly. Fixed a problem with ratings not showing up on the sortable archive. Reviews by Taxonomy: The post results are now shown in ascending order rather than descending. UBB_Author: Added an extra parameter for "class" to the get_links() method and format_links() method so we can add extra class names to the author's website links. Fixed a problem with book cover image sizes ("Medium", "Large", etc.) not working. Fixed the "read more" synopsis feature (it wasn't working). The jquery.shorten.js file was missing. Changed the Goodreads field from a URL field to a text field. Now you can prevent a dynamic link from being displayed by entering [nolink] into the box on the Edit Post page. Fixed a problem with the Convert Formats tool. If you've run it, you may want to run it again. Fixed a bug with the Upcoming Blog Tours widget where it was always complaining about the category not being selected, even when it was. Fix: The FTC Disclosure now converts the [source] shortcode into the actual source. Added CSS for the Reading Challenges add-on. Removed a piece of debugging code ( appearing as string(0) "" ). Added the content warning checkbox back to the Edit Post page (oops!). Fixed the CSS for the currently reading widget - it was using the wrong class name. Fix: The rating box now appears in the admin area, even if you have the rating box in the "Disabled" column. 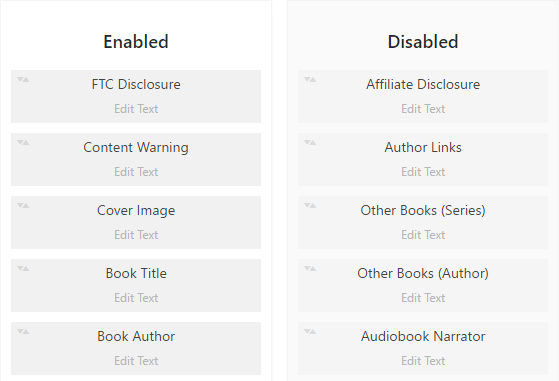 The new, secondary boxes for author, publisher, genre, etc. get hidden if you have "Enable Multiple Books" turned off. New: Added a new option for social media icon hover colour, if using Font Awesome icons. Fix: Fixed a PHP notice if the Font Awesome icon names aren't filled out in the social media widget. Fix: You're no longer forced to enter a Google API key AND a Goodreads API key. You can enter one or the other. Added an action after the settings input sanitization, for use in add-ons. Fix: Fixed a PHP notice in the settings panel textarea callback. Changed the purchase link boxes back to normal text fields (instead of URL fields) in case you're using them for something other than purchase links (tsk tsk). Fix: The "Don't Display Book Info" checkbox wasn't working. It is now. Fix: Added the "Don't Add to Review Indexes" checkbox. It was missing. Fix: Fixed undefined index notices in Posts > Authors page. Fix: About the Author Twitter URLs were not being created properly. Extra http:// was being added before the username in the middle of the URL. DO NOT UPDATE IF YOU DO NOT WANT TO USE 3.0 BETA. Fix: Stopped the rating and/or book title from appearing on every single page, regardless of whether or not a book was entered. This had to do with Schema markup being enabled. Fix: Now the Related Content tabs actually work when you click on them! Fix: Other Books by This Author should now return results correctly. Fix: Social media widget icons now link to the site profile correctly. Fix: Reviews by taxonomy archive - posts are now sorted by post title rather than date. Fix: Sortable archive now has the search boxes like it should! New: Added support for review number in the sortable archive. Complete overhaul of the plugin. DO NOT UPDATE IF YOU DO NOT WANT THE NEW VERSION! You will have to re-do your whole settings panel. Updated the social media code to use https when connecting to Nose Graze. Fixed a small problem when removing book cover images. Fixed an issue with "Get Book Info" returning a 302 error. Blogroll widget entries are now ordered by title instead of name (slug). New setting for limiting the "other books" results. Updated the jQuery Shorten Plugin to version 1.1.0. Fixed a problem with the Shorten Plugin being added twice, and the tabs script wasn't being added at all. Two new checkbox options in the Currently Reading widget -- these are used for filtering audiobooks in or out. Applied smart indexing to the sortable archive. Added a new social media icon for tsu. Fixed a fatal error when using Get Book Info. This error would occur if Google Books supplies an incomplete publication date. This has now been fixed. Added new social media sites for the widget: Riffle, Feedly, LinkedIn. Also added three "generic" icon slots. You can use these to include social media sites that aren't officially supported. You MUST upload your own icons with these generic slots though. Author bios: added a new field for Tumblr site URL. Added a new subpage under Ultimate BB called "Purge Cache". This will allow you to force the review indexes to refresh. Changed the date output from Get Book Info. The publication date now outputs as March 25th 2015 instead of 2015-03-25. Added a new option in Ultimate BB > Review Archives. You can now exclude categories from being included in the review archives. Fixed a problem in the reviews by series archive. Series starting with "A" weren't being formatted correctly. Now "A" is correctly moved to the end of the name and the series is archived under the next word. Added a new field where you can customize the taxonomy permalink structures. By default they're set to /reviews/author/ (or /reviews/publisher/ ) but with this new field you can change "reviews" to something else. It's located in Ultimate BB > Book Info. Scroll down to "Taxonomy Slug". Added a new setting in Ultimate BB > Review Indexes where you can disable the "smart formatting", where the archives automatically exclude words like "A", "An", and "The". Fixed a glitch with the "user" parameter not working correctly in wrap-up posts. Added a field for ASIN. Removed www from Instagram URLs. Fixed a problem with "Other books in the series" not showing up when you tag a book with multiple series. Added support for an add-on that changes the rating scale to 10 stars. Fixed a conflict with some theme thumbnails not appearing correctly. You can now limit the number of characters in titles in the "Related Posts" feature. If a post has tags but no other posts using those tags, the Related Posts feature previously yielded 0 results. Now it falls back to picking random posts from that same category instead. You can now automatically resize all book cover images to dimensions of your choosing. See Ultimate BB > Book Info to set it up. Added a new field for ISBN. Fixed a problem with the related posts feature showing 'by', 'same genre,' etc. tabs when the post wasn't a book review. Fixed a problem with the [show-reviews-in] shortcode where the results were being outputted at the top of the page. Fixed a problem with the [book-series] shortcode. Added two new book info config options: to list books by the same author and to list books in the same series. Visit Ultimate BB > Book Info to add these options to your configuration. Fixed a problem with the [blogroll-table] shortcode where the buttons were being outputted at the top of the page. Added a new function for rounding down half stars. Links are now permitted in spoiler tags. Updated the image upload features to use the 3.5 media uploader. There's now a dropdown to select which size cover image to use. Tweaked some CSS for the Review Requests add-on. Fixed a bug where the guid wasn't being set when importing images from Google Books. Removed shortcode dropdown in the visual editor because it was causing problems for some people. Tweaked the way I get the name of the previous month in the "Recent Reviews" widget. Some review indexes are now cached. Now they will only refresh when a new post is published. Added a new parameter to the [index-sortable] archive. You can now display the year you reviewed the book by adding this parameter: showdate="yes"
Added support for two new UBB add-ons. The shortcode dropdown in the visual editor is now back (WordPress 3.9+). Added support for upcoming Review Request Add-On. New shortcode: [book-publisher] displays the publisher of the current book. Social media widget: Fixed a problem with BookBlogging.net friend numbers not working if you have symbols in your username. Also added "reviewer" parameter for the [index-author], [index-year], and [index-rating] archives. You can now disable the "Get Book Info" feature (in Ultimate BB » Book Info settings). Note: If the feature has disappeared and you want it back, go to the settings page to enable it. New [wrap-up-posts] parameter for "user". You can use this to filter the results down to a specific post author. 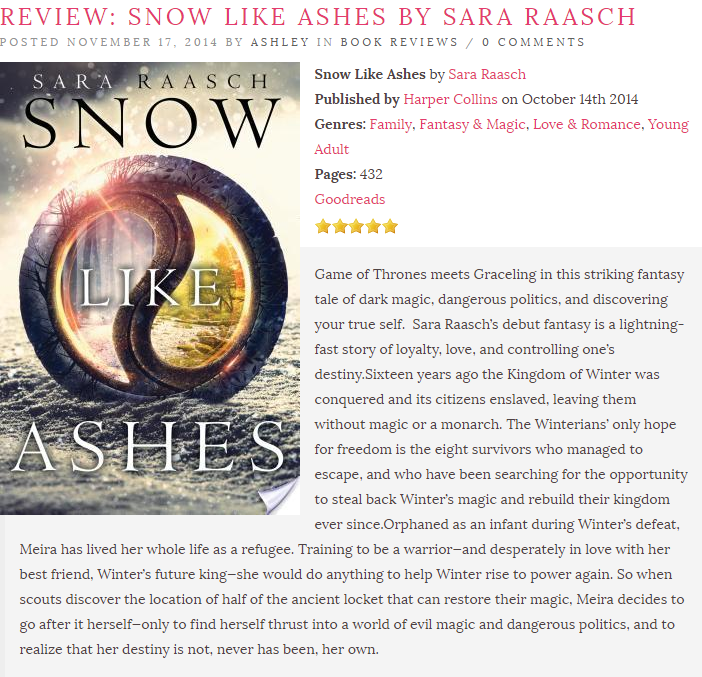 Example: [wrap-up-posts category="Reviews" date="March 2014" user="ashley"] -- This will show March 2014 reviews by "ashley". You can now specify an individual blogger in the "Currently Reading" widget. If you do so, it will only show the posts drafted by that blogger. This allows you to have two different widgets for two different co-bloggers. Fixed a problem where the BookLikes followers weren't caching. Added Audible as a social media site. Added a dropdown to the visual editor for all UBB shortcodes. Fixed some CSS issues with the UBB boxes (the "remove image" icon wasn't showing up). Fixed a "Invalid argument supplied for foreach" error when getting book info from Google Books. Added the simple stars rating to the reviews on the multi-reviewer archive. Fixed an issue with the reviews by title archive. If you reviewed two different books with the same name, they may have had weird numbers appear after the book title. This has been removed. 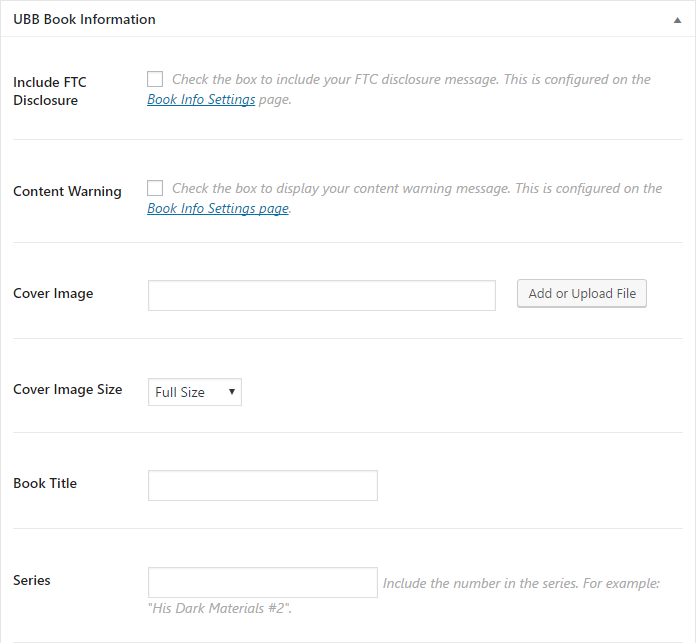 The "Get Book Info" feature is no longer restricted to just admins. Anyone with the ability to create a post should now be able to use it. The blogroll widget now lists blogs alphabetically. Fixed a problem with the new blogroll shortcode stretching in Firefox if the images are too big. You can now change the order of results from the [show-reviews-in] shortcode by adding extra parameters like this: [show-reviews-in tax="genre" name="Dystopian" orderby="name" order="asc"] So that will show reviews with the Dystopian genre and order them in ascending order by their post names. Fixed a problem with the image slider transition setting not sticking. Hopefully the dropdown boxes (for review/giveaway categories) should keep saving properly after updates now... You may have to re-save them one more time after doing this update, but if they keep resetting in FUTURE updates, please submit a support ticket to let me know. Switched from using "category__in" to "cat" in WP queries. This should fix issues with nested categories. Fixed some errors on the publisher/genre review indexes. Added a new shortcode to display all reviews in a certain category. Example: [show-reviews-in tax="genre" name="Dystopian"] This displays all reviews with the 'Dystopian' genre. For more details on this, visit the Ultimate BB "Shortcodes" tab and look in the "Misc." section. Added NetworkedBlogs to the social media widget. Added a new shortcode to display all the blog buttons in your blogroll: [blogroll-table] You must have the blog URL and button filled out in order for the blog to show up in the table. Fixed a problem with the category dropdowns not reading properly (fixed widgets/review indexes disappearing from last update). Updated all review indexes and widgets to use the "Review/Giveaway Category" dropdown menus, instead of the slugs. Check your Ultimate BB "Home" settings and make sure you have your "Review Category" and "Giveaway Category" set (and "Blog Tour Category", if you have that activated). Fixed a few possible PHP errors with the new automatic book info retrieval. Added a new option to the automatic book info that allows you to set the image as the featured image (in addition to or instead of uploading as the UBB image). Fixed a problem with the book title and author not being automatically set when you fetch book info using ISBN. Added a new filter that allows me to increase the number of purchase links limit (10) with UBB customizations. When using the new, automatic book info, you can now choose to search for a book by ISBN instead of title + author. New Feature: You can now retrieve some UBB book information automatically from Google Books, just by putting in the book title and author. Issued a fix for the "previous month's reviews widget". It wasn't showing last month's reviews properly when it was a new year. You can now use the [simplerating] shortcode in the review index configuration. This will display your rating for the book in simple HTML star format. Added bookblogging.net (BB) to social media options. You can display your number of friends or your blog's number of likes. Fixed a problem with the "Related Posts" text not appearing when you ask it to. Added new checkboxes to the "Giveaway" widget where you can switch the display to ascending mode instead of descending. New Weekly/Monthly Wrap-Up Feature: A new shortcode has been added to allow you to automatically display posts from the last week or month (great for wrap-up posts). Visit Ultimate BB > Wrap-Up for more details. Fixed a problem with the reviews by title index where symbols weren't being correctly categorized. Added new "Purchase Link Name" boxes to the book info page. You can insert the names of the book purchase sites you use and then those names will show up on the create post page for those boxes (instead of just "Purchase Link - #1" etc.). Added filters for the post types UBB supports. Added CSS to adjust the height of upcoming review images. Reviews by Title index now supports book titles that begin with symbols. Actually fixed the centered text problem in the currently reading widget title (fail). Added some extra CSS for the upcoming "Reading Challenge Add-On". Added a CSS class to all h2 tags in review indexes. Added an option to include review schema markup. Fixed a problem with the DNF rating image not appearing correctly in the "Reviews by Rating" archive. Fixed a possible problem where the spoiler shortcode wasn't working. Fixed a problem where the currently reading widget title was always centered. 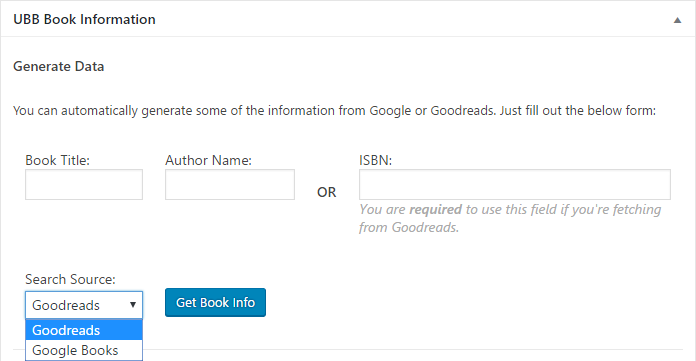 Added a new book info field for author links. If you enable this field, it will retrieve the social media links entered for the tagged author. You must have actually filled out the social media links for the specific author in Posts > Authors. This is almost identical to the social media display in the About the Author box. 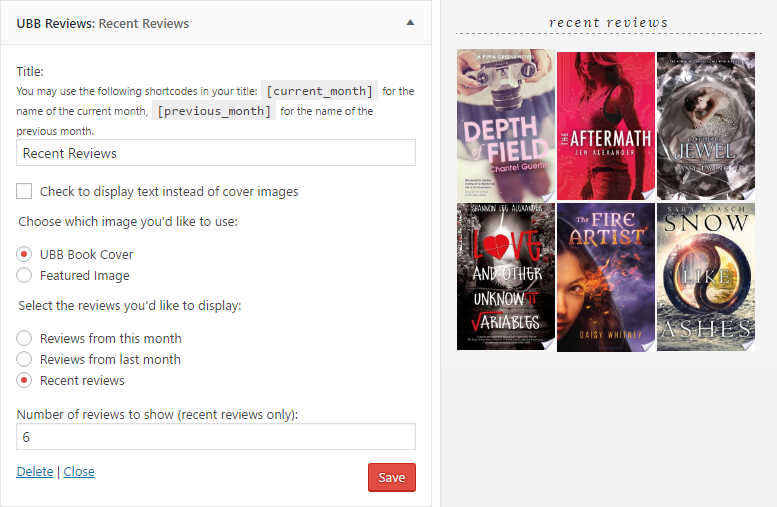 Added a new option to the Upcoming Reviews widget where you can opt to show the book covers instead of the title/author. This Month's Reviews widget has been turned into "Recent Reviews" widget. It's exactly the same, except there's a new option to just display a certain amount of recent reviews (not restricted to a certain month). Added 'nopaging' => true parameter to all review indexes. Fix - new sortable review archive: Fixed a problem where the reviewer column wasn't disappearing if you removed that parameter from the shortcode. BookLikes follower numbers now update automatically. Note: Make sure you read the instructions in Ultimate BB > Social Media to get this working. Bloglovin follower numbers now update automatically. You can now link your book cover image to Goodreads or any of your purchase links. If you had it set to Goodreads previously, you will need to re-set this option (Ultimate BB > Book Info). New option for adding Facebook meta data to the header. When enabled, UBB will tell Facebook to use your book cover image as the Facebook thumbnail when the post is shared. Added a new rating option for DNF. Updated the average ratings shortcode to use more updated functions (tax_query in the post query). Optimized the "Reviews by Title" shortcode so that it only queries posts in your reviews category. This cuts back on memory usage. Added a new setting in the Related Content tab that allows you to remove the "Related Posts" text above the tabs. Fixed a problem with an extra line break being added to the UBB synopsis. Changed Instagram URL in social media widget. Social Media Widget: Fixed a problem with the Facebook icon not showing up if you didn't also have the Twitter icon enabled. Added a new book format option for eARCs. Added new dropdown boxes in the settings for selecting your categories. The slug boxes will eventually be phased out in favour of the dropdown boxes, so make sure you fill them out now! Now using fetch_feed / SimplePie for getting latest posts in the blogroll widget. New option to include book information in excerpts. Added a new option for centering the book cover image. You can now use double quotes ( " ) in input boxes on the book labels. Upcoming Reviews (widget) are now displayed in the opposite order, with the first upcoming reviews at the top. Fixed a conflict between UBB and the Nexus theme by Elegant Themes when using the "Insert Media" button. New social media icon for BookLikes. Cleaned up social media widget code. Improvements to the Giveaway Widget: Current and upcoming giveaways are now displayed in two widgets (but they are configured in one widget). More support for the upcoming rating report add-on. Added e-mail icons to the colourful (non-default) social media icon sets. Added an option to change the social media icons on hover (only works with custom icon sets). Fixed a problem with the Blogroll widget appearing in list format if you have marquee/scrolling selected. Fixed some problems with the giveaway widget being weird and showing "Upcoming Giveaways" when none exist. Added support for future rating report add-on. Added a new option to the "This Month's Reviews" widget to use featured images instead of the UBB book cover. Added a new option to the Blogroll widget to show each blog's latest post. Slightly adjusted the position of the Blogroll menu item to avoid conflicts with other plugins. Giveaways Widget: There is a new option to display upcoming giveaways automatically. The giveaway information will be pulled out from draft and scheduled posts (as long as the giveaway info is filled in). Moved the related posts box further down. It should now be below more content, like the post signature on Tweak Me (once you update that too!). Fixed a problem with the "This Month's Reviews" widget not displaying the correct title if you opt to display last month's reviews. Fixed a problem with "Format: select" showing up for users of UBB version 1.5 and below. Fixed a problem with dynamic purchase links showing up on every single page, even if no book info is filled out. Added a new menu icon for the settings page. Fixed a problem with the new upcoming blog tours widget. It was only showing one banner at a time. You can now display only segments of book info if you want. Previously the book info would only be displayed if the book title was filled out. But some people used UBB for non-book review posts and didn't want to fill out the title. Images in "This Month's Reviews" widget now have equal height instead of equal width (looks better). New option in "This Month's Reviews" widget to display reviews from the previous month instead of current month. New option in "Books Reviewed Counter" widget to change the wording from "I have reviewed" to "We have reviewed". Fixed a problem that could result in the right files not being included. Fixed a problem with purchase links showing up even if you didn't fill out the box. Added multi-reviewer support to the "Books Reviewed Counter" widget. Now you can specify a reviewer's username to only count reviews from one user. Added support for inputting multiple series names for one book. Fixed "illegal string offset" error. Fixed a problem with About the Author photos not using the height you specify. If you had this problem, you will need to regenerate your post thumbnails using the "Regenerate Thumbnails" plugin. Added an option to customize the size of book covers in the "Currently Reading" widget. Added an option to customize the background colour of spoilers. More HTML tags can be used in spoilers, including images, bold, and italics. Added a new option for blog tours. You can activate blog tour support in the Ultimate BB settings in the "Home Settings" tab. This will add new boxes on the edit post page for uploading a blog tour banner. There's also a new "Upcoming Tours" widget, which is similar to "Upcoming Reviews". Added a warning message to the Books Reviewed Counter widget if you have not filled out your review category slug. Fixed HTML in the "Currently Reading" widget so that images are now inline and centered. Added an option to the Blogroll widget where you can specify the height of the buttons. Fixed a problem with author photos still cropping, even if you opted for no crop. New option for supporting "dynamic links" in purchase and Goodreads boxes (this was insanely weird to do so hopefully there aren't any problems with it...). Added support for audiobook narrators. New review indexes: by audiobook narrator, and an index for multi-reviewers/co-bloggers. All external links now open in new windows. The "Related Ratings" feature has been completely reworked into an entire "Related Posts" feature with different tabs for different types of post relations. New private fields section that can be activated. This adds new boxes to your post creation page that are private and don't show up on the front-end anywhere. They're for your reference/records only. The author features have been completely reworked. There is a new system for assigning author photos to authors, and there are now boxes where you can input an author's social media and website links. A new "read more" feature for blurbs. Brand new image slider with more customization features (for slider height, transitions, showing excerpts, etc.). Added support for FTC disclosures. New widgets: "Currently Reading" and "Upcoming Reviews". Fix: Twitter followers counter is now working correctly. Fix: Reviews by series index now supports series names that begin with numbers. Fix: Review indexes now take "A" and "An" into consideration. So a book titled "A New Day" will be filed under "N" as "New Day, A". Fix: About the Author box now works properly with multiple authors. Fix: The spoiler shortcode has been completely recoded. It's now better, more reliable, and less obtrusive. Added a new shortcode [get-bio author="Author Name"], which allows you to pull any author's profile from any post or page. Added an option which allows you to prevent a post from being added to review archives. Code improvements to the social media widget. Tweaked the image slider so that if you have it installed but no posts added to it, then the image slider will not display at all (as opposed to before when it showed a blank slider). Fixed a bug with entries in the "Reviews by Series" index not ordering properly when you have more than 10 books in a series. Changed the caching method for the social media followers. Your number of Goodreads friends now updates automatically! Fixed a problem with paragraph tags being added where they shouldn't in some of the widgets. Added two new review indexes: one sorted by genre, and one sorted by book publisher. Rewrote the functions for fetching social media followers for Twitter, Facebook, and YouTube. They now use cURL instead of get_file_contents, thus removing errors for hosts that don't support get_file_contents. The follower counters are also cached for about 30 minutes, which will reduce page load times. Rewrote the review index by title function so that books in each letter section are also alphabetized correctly (i.e. all the entries under "A" are sorted alphabetically, etc.). Rewrote the review index by series function so that the lists of the books under each series are sorted according to their position in the series, as opposed to before when they were sorted according to post publish date. Previously, if you published a review for Under the Never Sky #1, then Under the Never Sky #0.5, they would show up in the index in that order. But with this new method will automatically sort it into the correct order (Under the Never Sky #0.5, followed by Under the Never Sky #1, etc.). Made the new function for removing spoilers from RSS feeds compatible with older version of PHP. Changed the method of retrieving taxonomy URLs so that it's compatible when using the "Default" permalink structure. Fixed a bug with star ratings that use custom upload graphics not acknowledging half stars. Tweaked the "Series" display on book info so that the link now shows the number the current book is in the series (i.e. the book info page for "The Subtle Knife" will display "His Dark Materials #2" in the series section, instead of just "His Dark Materials".). Fixed a bug with the spoiler shortcode that produced an error in your RSS feed if your post contained invalid HTML. Changed method of querying taxonomy in review indexes. Solves a bug that would result in no posts found for a certain author/series if the taxonomy is a duplicate and has "-2" at the end of the slug.